There are some Caribbean islands that come up a lot when you’re on the prowl for travel bargains: Puerto Rico, the Dominican Republic, Jamaica, even Aruba because of its JetBlue service. But one island that’s hardly ever on my (limited budget) radar is Barbados. Not on my radar until yesterday, that is. That’s when a couple of editors (thanks Sarah, Anne, and Pati) stumbled into a nest of Barbados deals. First a little background. Orbitz just released a chart of spring destinations with the biggest year-over-year savings. Barbados isn’t just on that list, it tops it. Last year, the average per-night price at a three-star hotel was $325. This year it’s $89. That’s a whopping 72 percent drop. So on the whole, Barbados is a lot more affordable, at least for now. Living up to its name, CheapCaribbean.com is advertising an air-inclusive seven-night vacation package to Barbados for $399 per person. The package also includes extras like dinner vouchers, a $100 gift card, and other discounts. When I went through the booking process the best price I could find (typing in the promo code as directed) was $493 per person for the package, or $611 after taxes and fees. That’s for airfare from Miami (airfare from other departure points was more expensive) in September (still hurricane season), though deals were available for other dates as well. While this offer wasn’t as cheap as advertised, it is about half the usual price. That’s not the only deal to be found on Barbados. The Barbados Tourism Authority has a Best of Barbados deal for travelers booking five or seven nights at participating all-inclusive resorts. The deal includes $200 in airfare credits per person ($300 in September), the first night free, daily breakfast, a dinner voucher, and activity and car rental discounts. The three all-inclusive Almond Resorts on Barbados have sales of up to 50 percent off, with rates starting at $460 per person for four days and three nights. And at the five upscale Elegant Hotels properties on the island, there are discounts of up to 45 percent for advance bookings made by May 31 for travel through dates in December. 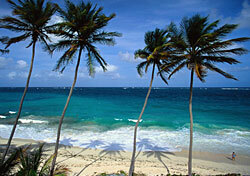 Have you seen other good deals to Barbados or elsewhere in the Caribbean? Share your tips with other readers in the comments section below. I’ll also use the comments section to keep you updated on any other Barbados deals I see in the coming weeks.